HIGIPS is a N×(M+1) multimicroprocessor parallel machine whose architecture is the combination of the pipeline architecture and multiprocessor architecture, i.e., the system in whole employs the pipeline architecture and each stage of the pipeline employs the multiprocessor architecture. Here, N is the number of stages of HIGIPS and M+1 is the number of processors in each stage. All processors of HIGIPS are NEC μPD70216 16-bit microprocessors. 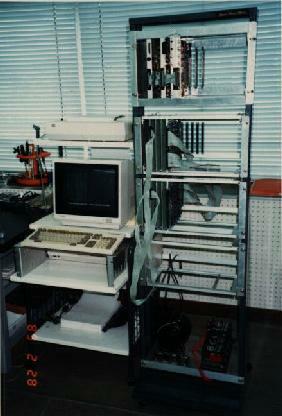 The photo shows the prototype HIGIPS which includes 3 stages, and each stage includes 3 processors (Max is 8).